Mulling how Jupiter Retrograde might fare for you? Jupiter is known to be the King of Gods and the bestower of knowledge and wit. Read on to get the picture of what this movement of Jupiter might have for you! Jupiter, or the King of Gods, is considered to be the most powerful and influential planet amongst the nine. It represents auspiciousness, honesty, justice, positive qualities and happiness. It is the karaka of second, fifth, ninth, tenth and eleventh house. As per renowned astrologers, people who have Jupiter in a dominating position in their chart usually gain weight and suffer from common ailments such as cough. They also have heavy vocal weight, brown eyes and brown hair. It is natural for a person having Jupiter-ruled horoscope to develop interest in spirituality, religious practices, philosophy and scholarly endeavours. Jupiter is known to be the ruling planet of Puravasa, Vishakha and Purvabhadra nakshatra and aspects fifth, seventh and ninth house of a chart. Favourable outcomes can be expected from the houses that are aspected by this planet while, the position of Jupiter in a particular house might not prove to be gainful. This planet is known to be advantageous for the signs Sagittarius and Pisces and unpropitious for the signs Virgo and Gemini. The planet Jupiter usually remains in retrograde motion for approximately 4 months in a year. After moving in a retrograde motion for about 120 days, Jupiter then becomes directional for another 4 months and finally sets after 4.25 months. Jupiter stays put in a sign for a time period of about 1 year and takes 13 years to finish the complete zodiac cycle. Normally, Jupiter provides one with intellect, wit and exuberance. Jupiter in a retrograde motion is quite close to bringing mystical power and strength under ones’ thumb. Those who have a retrograde Jupiter in their horoscope develop a knack for accomplishing the impossible. Their drive to work it off makes them achieve unlimited fame and boundless respect. Retrograde Jupiter in the fourth house of a chart gives a boost to the morale of an individual and transforms him into a visionary. The planet Jupiter will become retrograde in the sign Virgo on the 06th of February, 2017 at 12:12 and then, will become progressive in the same sign on the 09th of June, 2017 at 19:35. The planet is expected to remain in this retrogression motion for a total of 124 days. Let us know how this retrograde motion of Jupiter in the sign Virgo will affect the zodiacs. ARIES: Jupiter will remain positioned in your sixth house during the period of retrogression and thereafter progression. You would work extremely hard which would reap good results and success would follow. Your health would improve tremendously during this period. Though, you might move towards gradual obesity. Hence, watch out! Some legal issues might get seem to have gotten stuck for some time but they would eventually bring favourable results. Aspirants of higher studies might get a reason to rejoice during this period as luck would favour them. You might take a significant decision pertaining to your birth place. Your love relation would also improve in this duration. You would succeed in finding new avenues for increasing your income which would be beneficial for you in the near future. This period would prove to be the best for your father. REMEDY- Put turmeric in the water before taking bath with it. TAURUS: Jupiter will remain posted in your fifth house during the period of retrogression and thereafter progression.Significant improvements in education are indicated for the Taureans in this period. Sudden gains are likely too. An increase in your income is predicted but it may require extreme efforts and hard work. You would feel inclined towards gaining education and knowledge. You would be highly interested in preaching during this period. Your personal relationships might convert into long lasting commitments. Do not indulge in creating hype of petty things as that might result in problematic situations. Your children would benefit during this period. Students under this sign would be able to achieve their academic goals. You would be able to receive benefits from your elder siblings. Your seniors at work would favour you in all your strifes. Your inclination towards spirituality would increase in this period. REMEDY- Hold seven mustard seeds in your right hand. Rotate them around your face seven times in anti clockwise motion and throw them away. GEMINI: Jupiter will stay put in your fourth house during the period of retrogression and thereafter progression. Improvements in your marital life are foreseen. You might plan a pilgrimage during this period. This period might prove to be a gainful period for business partnerships and professional associations. You would perform fantastically at work place which would lead to improved results. Your domestic life would improve and would gain harmony in this duration. Love and strength would manifold in your familial relationships during this period. Your spouse would do well in their professional endeavours. Your relationships with in-laws would improve. Also, your health is expected to improve as well. An auspicious event might take place at home during this period. REMEDY- Apply Kesar Tilak on the following parts using your ring finger in the following order: first on naval, then on throat, then on both the earlobes, then on your forehead and then on your tongue. CANCER: Jupiter will remain positioned in your third house during this period of Jupiter retrogression and thereafter progression. Your luck will be in your favour throughout. You might plan a pilgrimage too. You would find solace in religious acts. Improvement in marital bond are also indicated in this duration. You might turn a wee bit lethargic and sluggish. An increase in your income is indicated in this duration. You would gain respect and recognition in society. Professional and monetary gains are likely during this period. Your father might gain in his professional endeavours. You would gain from your siblings. Your relationships with your siblings would improve too. Your competitors and opponents would try to dominate you in this period. Success will only follow if hard work is done while avoiding a sluggish behaviour. You might plan a small trip during this period. REMEDY- Worship Lord Vishnu and Goddess Lakshmi and offer yellow sandalwood, yellow flowers and pure ghee to them. LEO: Jupiter will remain posited in your second house during the period of retrogression and thereafter progression. You would develop a knack for accumulating wealth. Exceptional gains in the professional arena are indicated during this period. You might gain inheritance of an ancestral property. A sacred ceremony, childbirth or a wedding is predicted to take place in the family. Avenues for gains from the in-laws would open up during this period. Good academic results for students are predicted. Your children would progress too. Though, your health might suffer. Avoid sweets in this duration. Health of your children would improve. You might consider repaying an old loan. Happiness will prevail in your domestic life. Those associated with education or finances would gain tremendously during this period. REMEDY- Worship Lord Ram regularly. VIRGO: Jupiter will remain put in your ascendant house during this period of Jupiter retrogression and thereafter progression, Your relation with your spouse would improve significantly. You both would be supportive of each other through thick and thin. Though chances of petty tiffs occurring in your marital relation are also high. Your expenses might increase slightly during this period. You might spend on a legal issue that has been stuck for a while now. Your intellect would improve too. Your inclination towards spirituality would increase in this duration. You might indulge in religious activities. The health of your mother would improve during this period. Try to hold any big decisions pertaining to your professional partnership. You might plan a trip to a foreign land in this duration. You would have to work harder to achieve your professional goals. REMEDY- Make a donation of Salt to a needy person on Thursdays. LIBRA: Jupiter will remain placed in your twelfth house during this period of Jupiter retrogression and thereafter progression. Your expenses would increase during this period. Also, your sources of income might increase in this duration. Chances of you encountering more than one source of income to increase your profits is high. You might take loan for personal expenditure as well. Your competitors and opponents would have an upper hand on you during this period. Your health might decline hence, pay close attention to what you eat during this period. Halt any plans of initiating a court case during this period as it might not turn out as per your expectation. You would spend on religious activities and spiritual endeavours. Your siblings would benefit during this transit period. Avenues for increased income from foreign sources would open. REMEDY- Offer a potato to a Banana tree or in a Vishnu temple. SCORPIO: Jupiter will remain posited in your eleventh house during the period of retrogression and thereafter progression. You can expect professional gains through applying your quick wit and intellect. Professional gains would increase during this period. Your domestic life would gain harmony and synchronization. Abstain from tiffs with seniors. Try to focus on your work and achieving your professional goals rather than indulging in unnecessary arguments. You would have an upper hand over your competitors and foes during this period. Your income would get a boost in this duration. Your social circle is also predicted to improve. Formation of allies with learned and renowned people would take place in this period. You would be inclined towards preaching and giving suggestions in this duration. Abstain from lending money or paying off your bills on Thursdays. Your commitment in love would increase. Those whose’ marriage is getting delayed might get a reason to celebrate during this period. And those who are married would enjoy a blissful period. REMEDY- Take bath with water that had turmeric mixed in it and chant Guru mantra regularly. SAGITTARIUS: Jupiter will remain posted in your tenth house during this period of Jupiter retrogression and thereafter progression. You would work exceptionally hard for achieving your professional goals. You would be brimful of passion and impetuousness to achieve the most and the best during this period. Your domestic life would be full of happiness and harmony. A long awaited desire might get fulfilled during this period. You would indulge in charity and donation in this duration. You would find solace in pilgrimages as well. Long distances travels are on the cards. You would work harder in your professional arena during this period as you would become highly devoted towards your work. You would like to be extremely assured of things and situations and hence might develop a habit of double-checking. You might plan to renovate your home during this period. You might also consider buying a new vehicle. Aspirants of higher education would gain in this duration. REMEDY- Chant "Om Gum Guruve Namah" regularly. CAPRICORN: Jupiter will remain positioned in your ninth house during the period of retrogression and thereafter progression. Income from foreign lands can be expected during this period. Your siblings would be supportive of you. Professional and personal gains are also indicated for your siblings. Also, health of your siblings would improve in this duration. You would make professional gains through the intervention of your siblings in your professional arena. You might make a charity in hospitals. Students belonging to this sign, might gain exceptional academic success during this period. You would indulge in virtuous pursuits during this period. You might gain interest in spirituality in this duration. You might also consider changing your job. Partnerships might prove to be beneficial for your professional growth during this period. Your expenses might increase. Try to keep a tab on unnecessary expenditure and spend wisely during this period. REMEDY- Pour water on the roots of a Peepal tree and offer some turmeric, camphor and lemons. AQUARIUS: Jupiter will remain positioned in your eighth house during the period of retrogression and thereafter progression. A substantial increase in your expenses is indicated during this period. You might have to see a few losses too during this period. Splurging extensively on your in-laws is also on the cards. You might help your in-laws financially too, if the need be. The health of your spouse might decline during this period. Your earnings might increase gradually but would require diligent and continuous efforts. Your interest in occultism would increase during this period. Keep an eye on your speech and conduct as your misbehaviour might lead to problems in near future. Undesired or unplanned travel might keep you on your toes. Take care of your health during this period. Keep a watch on what your eat and exercise clean and healthy eating habit. Sudden and impromptu events, plans and situations might come your way while this movement of Jupiter lasts. PISCES: Jupiter will stay put in your seventh house during the period of retrogression and thereafter progression. Your marital life is expected to be blissful. You would feel highly devoted towards your spouse. You would significantly prioritise them over other people and your routinely work. This period is predicted to be particularly gainful and productive period for those who are associated with a business and/or partnerships. You can expect to be in the pink of your health during this period. You might recover from any past illness or injury. Your social circle would increase and become influential in this duration. Professional success would be followed by your wisely made decisions. Aggression that has kept you anxious for a long time would decrease during this period. Spirituality would prevail in your thoughts in this duration. An increase in your income is predicted. Your status in society would increase. You can also expect a promotion at work. Avoid being rigid on issues of the past and try to move on with a positive and accepting mindset. REMEDY- Chant "Om Brim Brihaspataye Namah" regularly. 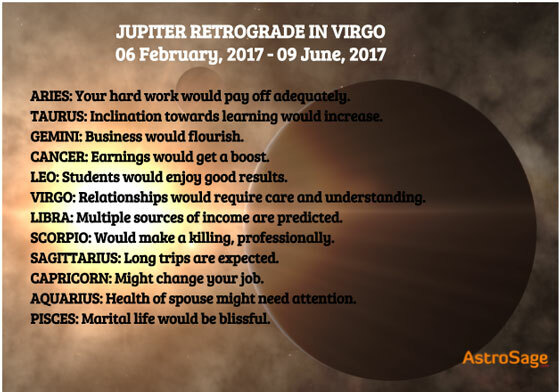 We at AstroSage, wish that this Jupiter retrograde and progression brings with it new energy and freshness to your life. We hope that you make the most of it!